Am I the only one worried about Turkeys likely invasion into Iraq? The news media is focused on Pakistan this week, apparently having just noticed that the country is run by a military dictator. As one who knows a thing-or-two about Pakistan, I greatly fear for it's future. However, the events of this week are nothing new. 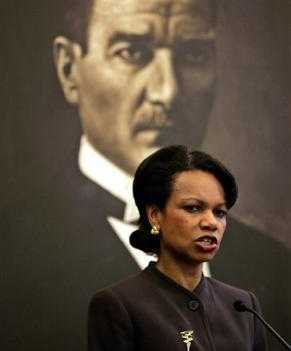 The other big international news this week was Condoleezza Rice's wink and nod to Turkey's Ali Babacan for an attack in Iraq. Common sense tells me an attack within Iraq by Turkey would be a huge mess and make it much more complicated to stabilize the country. Considering Rice's incredibly bad diplomatic skills, it's possible that she has no idea she just green lighted an invasion. Now, according to the Bush Doctrine , which everyone in the Middle East is acutely aware of, Turkey has the right to preemptively and unilaterally invade a country if it's perceived as a threat. There was a time when I assumed that someone as bright and intelligent as Condoleezza Rice knew something that my common sense wasn't telling me. I mean, you dearly hope that's true with out leaders. Now I trust my common sense more than the best and the brightest in the Bush Administration. Well, common sense says that having another country in Iraq killing people and blowing things up is going to be a huge, tragic mess for everybody, including the U.S.
From the memory bank: This visit by Rice reminds me of when the G HW Bush administration accidentally green-lighted Saddam's invasion of Kuwait.